Most of Myanmar's snow-capped mountains are located within the state of Kachin, either near the borders of China or India. Gateway to the Myanmar Himalayas is Putao and travelers will prepare food, porter and other necessary things here. It takes around 2 weeks, to the last human habitation Taphungdan village at the foot of Mt. Hkakaborazi, the highest point in the southeast Asia. And it may take 5 days from Taphungdan village to the base camp for Mt. Hkakaborazi. It may take 40 days for tourists to complete the tour to the base camp, thus let us recommend you to try the snow mountains of Mt. Pongkan on the Indian border where trekking and soft adventure tours are also available. Mountains of Pongkan start from Pongkan Pass near India and snow mountains of Arunachal Pradesh,Mishimi Hill in India. Are you ready for a mountain climbing trip or an expedition to one of the world's greatest climbing areas? Mountain climbers can enjoy an endless variety of challenges. Mountains are a climber's playground, its walls and crags are an integral part of a larger wilderness ecosystem to be explored first hand. 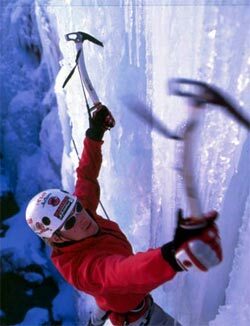 Mountaineering schools teach the very latest in modern snow and ice climbing techniques to all levels of ability. The combination of altitude and severe weather challenges the mountain climber to readily adapt his or her skills to an ever changing mountain environment. Your guide will help you meet that challenge. This is the so-called observation deck of Myanmar-Himalayas, as it is just 4 miles away from Indian border where Mishimi Hills of Arunachal Pradesh, in India, Mountains of Pongkan in Myanmar peak in the sky. On clear sunny days, snow-capped mountains of Chinese territory can also be seen. This is a heaven for people with enthusiasm in wild orchids and butterflies. Accessible by ordinary trekking. Highest peak in the Phonkan Mountains. (4,655m height) Beautifully shaped peak. As of May 2001, no foreign tourist has conquered this mountain yet! There is a crystal-clear-water lake under the top. No other mountains have lakes on top in Myanmar-Himalayas Mountains. Accessible by very hard trekking.Above-mentioned Mt.Phonekan is for ordinary trekker. Mt. Phangram and Mt. Phonyin is experienced trekker. There are some more courses recommended for trekking tours. "Razi" means mountain in Rawan language. Highest peak in Southeast Asia. Trekking tour to the village of Taphungdan at the foot of the mountain is already popular among FIT travelers from Europe & USA. Most of them are not just trekkers but with vast knowledge of wild orchid, butterflies or bird-watchers.